The situation was a familiar one in Oromia. Police shot dead an innocent civilian and the western district responded with a three-day strike. But this was not a scene from the height of the Oromo Protests that helped sweep Prime Minister Abiy Ahmed to power earlier this year. It was in late July after he had been in office for more than three months. Shockingly, the victim in Dembi Dollo was Birhane Mamo, a pregnant mother in a late night Bajaj taxi en route to hospital to deliver her third child. Since 2015, much Oromo anger has been directed at the federal government, but in recent months the people in western Oromia have been opposing their own regional administration. That occurred after a new struggle emerged between Oromia’s ruling party and a revitalized, if still divided, Oromo Liberation Front, which sees an opportunity to regain the influence it lost over two decades ago. The predicament highlights some of the tricky ramifications of Abiy’s radical opening of political space. Last week Oromia Chief Administrator Lemma Megersa and Foreign Minister Workneh Gebeyehu travelled to Asmara for successful discussions with a holdout OLF faction led by Dawud Ibsa, who has been supported by Eritrea’s government. Other OLF or former OLF elements have already returned to participate peacefully, including the Oromo Democratic Front’s Lencho Leta, and senior figures Hailu Gonfa and Kamal Gechu. Abiy’s aspiration is to have free and fair elections in 2020, which would present a major challenge for his Oromo party, despite the huge advantages of incumbency in Ethiopia for the four parties of the ruling multi-ethnic coalition. The situation in Ethiopia’s most populous region demonstrates the complexity and dangers lying behind an otherwise highly successful period for Oromo politics. Despite the rivalries, Oromo People’s Democratic Organisation (OPDO) leader Abiy commands the federal government with passionate support across ideological and ethnic lines. And his power is partly a result of tapping into successful mobilization on the ground by youthful Qeerroo protesters supported by online activists. But that productive convergence of interests came at a cost. Oromia’s local administrations were ransacked by demonstrators and discredited for their authoritarianism, corruption and alleged subservience to the Tigrayan People’s Liberation Front (TPLF). Now the reconfigured OPDO government needs to control and rebuild Oromia, but at a time when the OLF and others are seizing on the destabilization. Some think the deal with Dawud could be a turning point. “With a tendency of pushing for chaos as a bargaining mechanism from opposition Oromo political factions, there was a danger of widespread anarchy in Ethiopia, but now there is reason to hope that the situation will stabilize,” said Birhanu Lenjiso, the Deputy Director of the East African Policy Research Institute. In response to the OLF threat, OPDO firebrands started blaming the liberation front in early July, days after its terrorist designation was removed by parliament. Officials said Dawud’s group— known as OLF-Shannee Gumi Sabaa, which refers to the OLF’s top committees—was causing unrest and working with ‘Woyane’, a colloquial name for TPLF, and ‘deninet’, the National Intelligence and Security Services, whose influential director Getachew Assefa, a TPLF politburo member, was removed by Abiy in early June. Many Oromo social media users support vocal OPDO officials like Milkeessaa Miidhagaa, in the same way that they backed activists such as Jawar Mohammed during the Oromo Protests. What is less clear is the affiliation of the Qeerroo protesters, a loosely networked group. Qeerroo may be supportive of OPDO reformers known as Team Lemma, Lencho Lata, the OLF, other Oromo opposition leaders like Bekele Gerba, as well as Jawar. 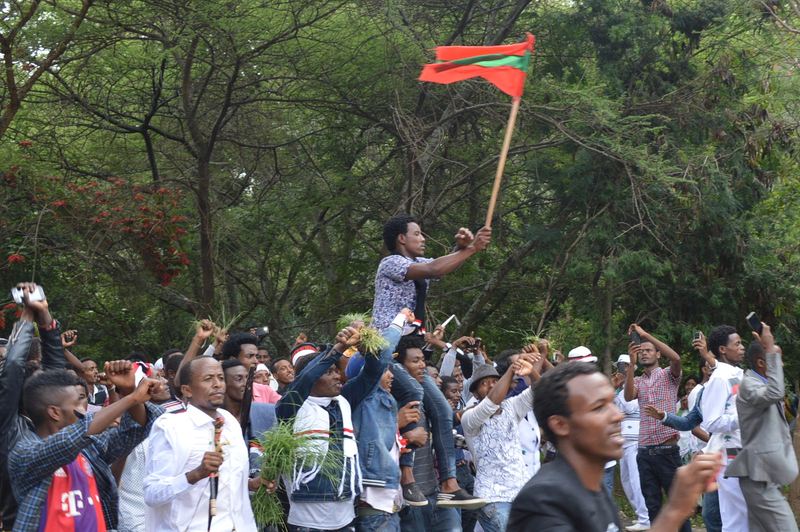 Now opposition to the TPLF is no longer sufficient to unite, and the initial victory has been won, there is a struggle to win the hearts and minds of revolutionary Oromo youth. Recent OPDO allegations have been about violence in West and Kellem Wollega zones that were traditionally OLF strongholds. The OLF formed in 1973 to fight for Oromo independence and was loosely allied with the TPLF in the long struggle against the Derg. But during the transitional government from 1991 to 1995 the two liberation fronts fell out and the TPLF militarily routed the OLF. Created in 1989, the OPDO was nurtured by the TPLF to run Oromia in the new multinational federation, and, until the advent of Team Lemma, never really recovered from that ignominious beginning in Oromo eyes. In Nedjo in West Wollega, Getachew Addisuu was killed on July 2 when his house was burned. After accusations from regional officials, OLF-Shannee issued a denial and accused OPDO of blaming it to try and turn public opinion. On July 3, the federal government arrested a Qeerroo called Shanqo Solomon from Nekemte following days of celebration with OLF flags flying when the government was rallying support for the Prime Minister. After the arrest was protested, regional and federal security forces detained influential people. Dembi Dollo, capital of Kellem Wollega, became a flashpoint after bridges were painted OLF colours and flags hung throughout the town. The Government deployed soldiers, Federal Police and Oromia police. A military truck was attacked with a grenade on the day it arrived, a resident said. On July 8, an individual fleeing friends of a man he struck with a machete in a jealous rage sought protection in the police camp. Abush Getachew, who was hoping to head to university soon, was killed in a panicked response by officers. Security forces have been hunting the semi-legendary Abbaa Torbee, who, after issuing warnings, is said to have assassinated perhaps 20 officials responsible for repression during the protests. On July 17, they shot bank security guard Badhaasaa Tesfaaye when he queried the harassment of a shop owner. And then came the killing of Birhane. On July 23 at around 11.30pm, she was transferring to Dembi Dollo Hospital from a clinic in Sayo Woreda. She was killed on the spot and her family injured when Oromia police shot at the taxi. The town protested in the morning and agreed a market boycott from July 26 to July 28, which was observed throughout the zone. Now, after the Asmara deal with Dawud, there are hopes of reduced tensions. People in Dembi Dollo have already expressed cautious support. But whether peace prevails depends on the extent of fragmentation and OLF-Shannee’s level of control over events on the ground. The situation elsewhere in Oromia and on its borders suggest there may well be more problems in what is a febrile and anarchic environment. In Goba in Bale region, an argument over statues in mid-July descended into violence that killed seven, apparent evidence of tension between Orthodox Christian and Muslim communities. On July 13, a mob beat a Somali driver for Dire Dawa Mass Media Agency to death in Mieso town in West Hararghe, Tigrayans have been similarly targeted, and reports are emerging of the mass violence inflicted on the ethnic Gedeo people by Oromo in recent months. 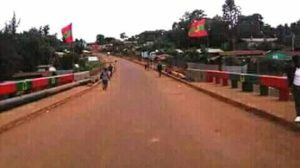 Social media was convulsed in debate over the gruesome vigilante killing of an individual in Shashemene on Aug. 12 when crowds gathered for Jawar’s return. Meanwhile, the federal government took forceful action to change the leadership of Somali region, which led to more raids on the Oromo-Somali border, probably provoked by malcontents from Abdi Iley’s regime. Serious fighting was already occurring between the groups around Moyale in the south. Recognizing the struggle ahead, the OPDO plans to change its name to the Oromo Democratic Party, and an alliance with former OLF leader Lencho Leta’s group looks possible. But while Abiy’s big tent politics have pleased a diverse set of actors so far, his focus on national unity has alarmed some Oromo activists. Instead of inspirational rhetoric regarding Ethiopiawinet, they want, at a minimum, action on creating an autonomous Oromia in a democratic federation; structural transformation to end the unfair extraction of Oromo resources; Afaan Oromo as a federal government language; and Oromia’s constitutional “special interest” in Addis Ababa/Finfinne to be appropriately defined. The challenge for Abiy and his rebranded party is achieving those regional goals while holding a broad national coalition together. Published under Creative Commons Attribution-NonCommercial 4.0 International licence. Cite Ethiopia Insight and link prominently to this page if you republish. Ethiopia future is on the hands of Oromo People. I am Agaw and have families and friends in Dembi Dollo. Social and political revendications are rights; but violences, displacements and killings of innocent people has no justifications. Thank you! I was getting fed up with the snippets of exaggerated and often unsubstantiated information coming out of social media. Nice observation. It may or may not be true in real situation but the analysis that you are seeing is absolutely my feeling too. Really good one.